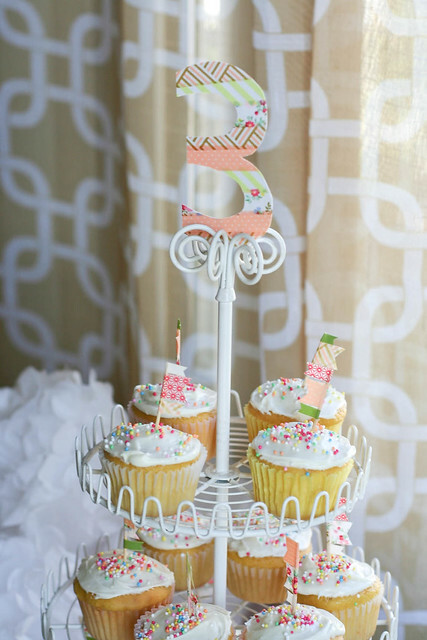 I thought I'd share a few of the crafty party details that I managed to put together last week, to hopefully show how small and simple doesn't have to be boring or uninspired. I shared this photo earlier this week, but I thought I'd include it here to give you the idea of the set-up. We moved our table to the back wall/window, so it would make more room for seating, and hopefully look somewhat put-together and pleasant. 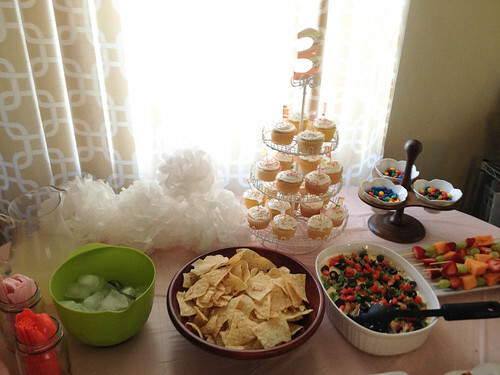 The above photo was taken pre-food and pre-cupcakes, but you'll see our simple spread later on. 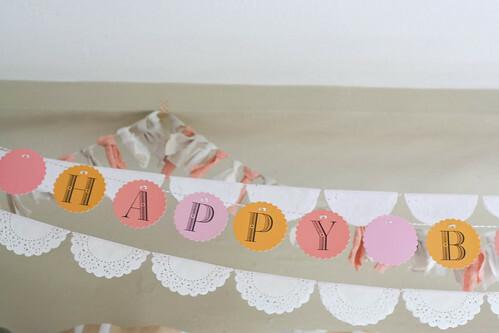 I have a thing for paper doily banners (seriously, could anything be easier or more adorable? ), so I put together a bunch to hang above the room. I used washi tape to attach them to the wall for easy removal (you're welcome, landlord). Some of these doilies were purchased in packs at the dollar store, so they were a great deal. 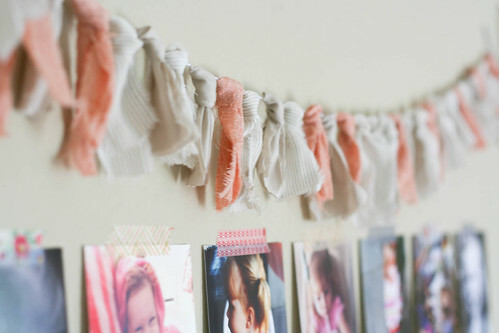 To make them, you just use glue stick (or another adhesive), fold them in half over some bakers twine, and there you go! Instant prettiness. I always keep these banners to reuse, too—you can fold them up into little stacks for easy storage. You can find doilies here, bakers twine in a bunch of colors here, and washi tape pretty much anywhere (but I recommend doing a search on Etsy, which is where I have had the best luck finding pretty patterns for a good price)! 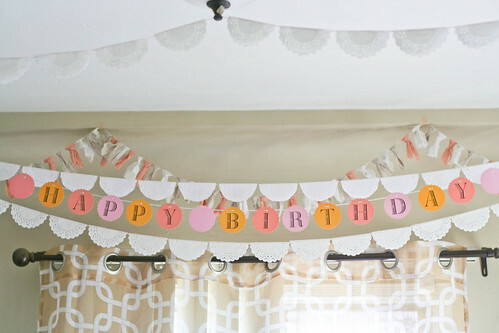 The happy-birthday banner was purchased a few years ago from Michael's—on clearance, so I think it is now discontinued. I intend to keep it forever and ever, amen. It will probably make an appearance for every Eisley birthday from here on out, to be quite honest. I have a bunch of scrap fabric that I haven't used in a long time (yes, I still need to re-learn how to use my sewing machine), so I decided to also make some fabric garland. 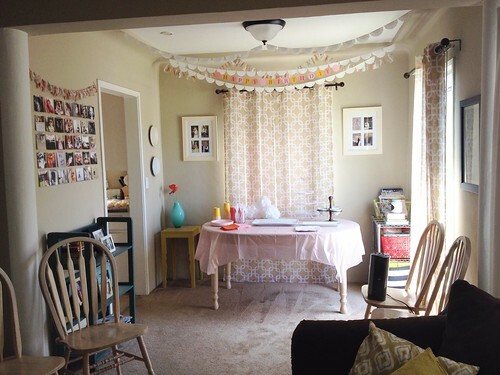 I did a Pinterest search for fabric garland, and most of the results seemed too time-intensive. I decided to wing it, and just ripped a few different patterns of fabric into strips (around 1.5" wide), cut them into 8" or 9" rectangles, and knotted them onto some bakers twine. It still took a fair amount of time (maybe 1-2 hours total?) but the result was worth it—and I will keep these to reuse sometime down the road. To those who are wondering, I ordered the prints using the Walgreens app, and the prints I ordered should have been 4"x4", but when I picked them up I discovered that they had an extra 2" of white space on each print—and I had to crop every photo before displaying it. Kind of a bummer! I also found the quality disappointing (grainy, over-sharpened photos, even though the images from my phone were not low-res). This is the second time I've used Walgreens for prints and have been disappointed, but I know people have recommended both Costco and the Prinstagram app for square-format photos that are high-quality. I was able to get the wall of prints in remarkably straight lines (the photo is deceptive, I promise!) by doing the center, vertical row first. 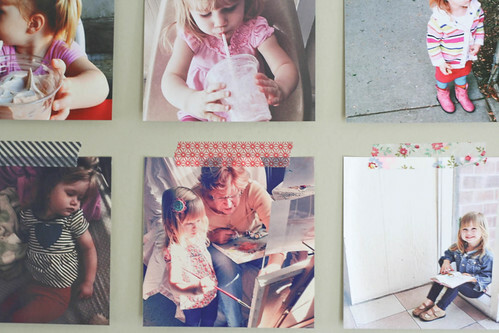 From there, I just worked my way out, using strips of washi tape to attach the photos to the wall. (Using washi tape also makes it easy to straighten the photos over and over, if you're really obsessive like I am.) 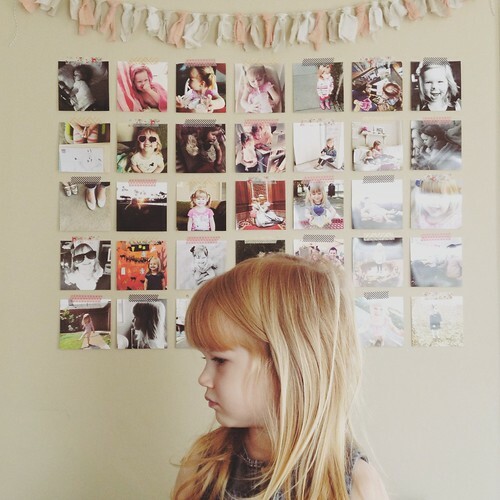 This style of photo wall is very forgiving, though, with the washi tape making it more carefree and imperfect! 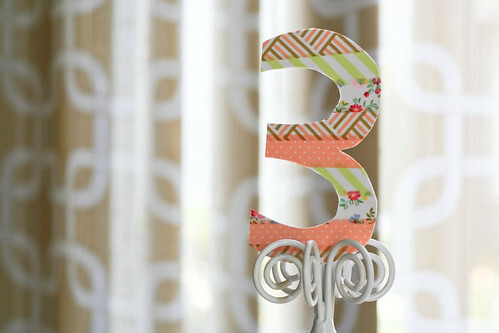 I made a random number three to put on top of the cupcake holder, which turned out a little wonky, but I like it. I just drew the number on card stock freehand, covered it with strips of washi tape, and cut it out. Easy peasy. 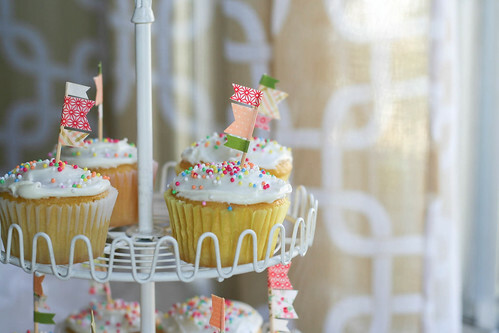 Aaaaand to continue showcasing my love of washi tape, here are the cupcake toppers I made! I was a little too excited over these, and they took way too long to make (all things considered), but they added a fun touch to the cupcakes. Yes, the cupcakes were made from a boxed mix, the frosting was not homemade, and for these things I refuse to apologize. Perhaps someday I will be a bona fide Martha, but today I am not! 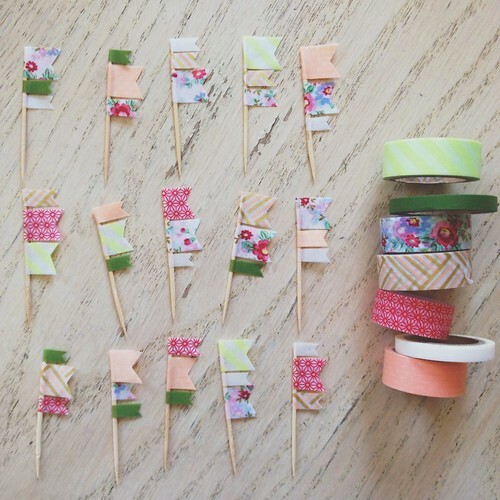 All these toppers didn't even make a dent in my stash of washi tape (no, really—it's a little ridiculous), so it was again something that was very inexpensive but totally cute. It was so hot in our place, that it's a bit of a miracle that the icing didn't melt off immediately. I'm glad I got a few photos before they were devoured! On a somewhat un-crafty note, we kept it easy with the food, making taco dip, fruit skewers, pretzel-kiss-M&M-thingies, tortilla pinwheel appetizers, and some lemonade. And those paper puffs on the top-left were going to be hung, but then after I set them on the table temporarily, I kind of liked how they looked there and called it a day. After all that work, her party turned out beautifully. 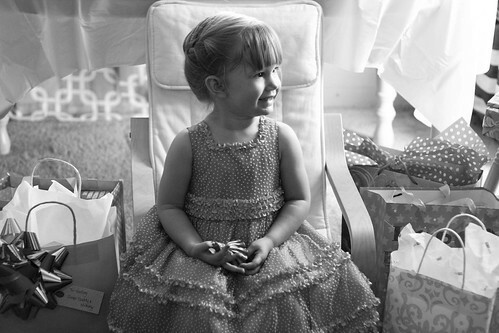 It was a busy, hot day—but also a day filled with sweet friends and cherished family and presents to unwrap and bubbles to blow and party dresses to wear and memories to make. Yes, indeed, I would say it was a success. Looks and sounds like a wonderful day. Love your craftiness! 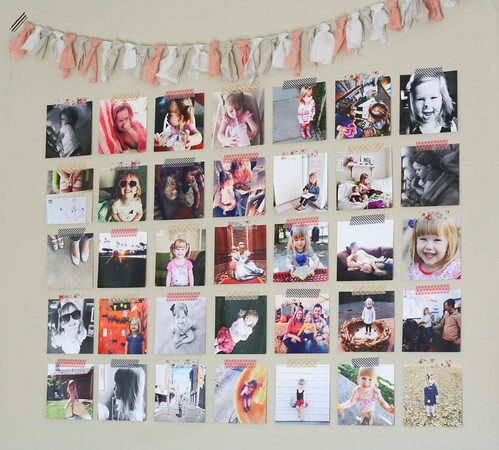 I would keep the photo wall up forever! with the fabric garland!